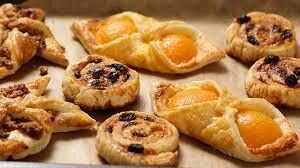 A basic Danish pastries course, no previous experience necessary. Start the day with some freshly baked cookies, locally ground and roasted coffee or a pot of tea, a range of fresh juices, fruit teas etc. maybe even some fresh Brioche or Danish pastries. We will keep you topped up with drinks throughout the day. On this basic course we give you the simplest and easiest method of producing commercial quality Danish pastries using the ingredients suggested. you will be shown how to produce a range of different varieties and the you can produce any combination of those demonstrated. varieties will include, Cinnamon Swirls, Bear’s Claws, Envelopes, pockets & Pinwheels using different fillings and fruit or toppings. Recipe cards to take home are supplied.